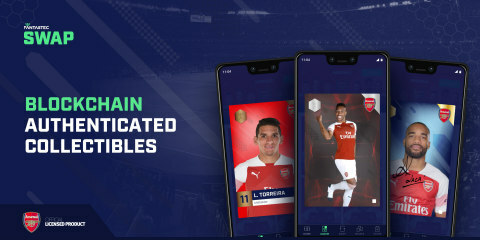 Fantastec announced today its first football licensing agreement with Premier League club Arsenal FC for a new blockchain authenticated collectibles app called Fantastec SWAP. London-based Fantastec is a leading sports fan technology innovator, and its blockchain based ‘SWAP’ app will have broad appeal to global sports fans, gamers and sports card collectors alike. Fantastec SWAP unlocks unique and authentic club content through the app, like player autographs and exclusive footage. With its innovative blockchain technology, fans around the world can now discover, collect and swap officially licensed club collectibles with other fans with complete trust. Fantastec SWAP encourages fans to build their squad collections by purchasing in-app team packs, and by swapping with other fans all over the world. Completed collections earn rewards from the teams and allow fans to move toward more difficult levels of collecting with rarer collectibles and increased rewards. The unique blockchain platform offers social network like features enabling fans to connect and swap their collectibles with the same confidence and trust they would have if they were interacting physically. This is especially vital when swapping rare player autographs. Fantastec’s “fan-first” perspective connects international fans with the sports that drive their daily lives. A unique blend of scientists, engineers, data analysts, designers, researchers, sports marketing creatives and communication professionals, Fantastec is inventing the future of international fan engagement.